Visible alcoholic beverages, glass, and Styrofoam are not permitted in City of Austin Parks. Any alcohol must be in an opaque plastic cup. This also includes carrying a 12-pack or case of beer uncovered to the field. Everything must be in a cooler or backpack at all times. Beverages may be consumed in the dugout, common area, and coach’s boxes, but not on the field of play itself. All SSC participants, spectators, officials, and gameday coordinators share the responsibility to leave venues in a clean, trash-free condition. Visible alcoholic beverages, glass, and Styrofoam are are not permitted in City of Austin Parks. Any alcohol must be in an opaque plastic cup. This also includes carrying a 12-pack or case of beer uncovered to the field. Everything must be in a cooler or backpack at all times. Beverages may be consumed in the dugout, common area, and coach’s boxes, but not on the field of play itself. All SSC participants, spectators, officials, and gameday coordinators share the responsibility to leave venues in a clean, trash-free condition. Visible alcoholic beverages, glass, and Styrofoam are are not permitted in Travis County Parks. Any alcohol must be in an opaque plastic cup. This also includes carrying a 12-pack or case of beer uncovered to the field. Everything must be in a cooler or backpack at all times. Beverages may be consumed in the dugout, common area, and coach’s boxes, but not on the field of play itself. All SSC participants, spectators, officials, and gameday coordinators share the responsibility to leave venues in a clean, trash-free condition. Fields used for SSC Football are approximately 40 yards wide and 100 yards long. The field is divided into four 20-yard line to gain zones and two 10-yard end zones. The SSC will provide all field equipment and “Triple-Threat” style flag belts. 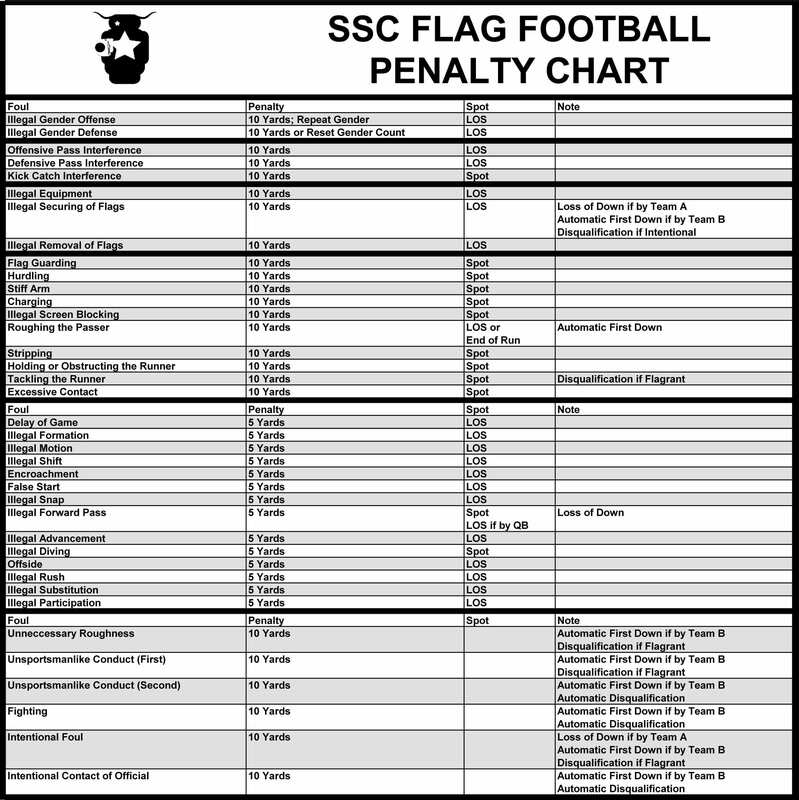 Players may use their own flag belts if approved by an SSC official. “Sonic” or “Pop” style flags are not permitted. ***SHORTS OR PANTS WITH POCKETS OF ANY TYPE, SIZE, OR LOCATION ARE NOT ALLOWED*** Shorts and pants with pockets pose a significant safety concern and are thus not permitted in any SSC Flag Football League or Tournament. Taping down pockets or turning inside out does not make shorts or pants legal for play. Zippering pockets does not make shorts or pants legal for play. ***CUT-OFF SHIRT SLEEVES RESULTING IN EXCESSIVELY LARGE ARMHOLES ARE NOT ALLOWED*** Players should order the appropriate size shirt so that it is long enough to remain tucked in the pants/shorts during the entire down or short enough so that there is a minimum of four inches from the bottom of the shirt to the player’s waistline. Sunglasses made from any hard, unyielding material. The maximum numbers of players on the field is eight. The minimum number of players is six. The maximum number of males is five. The minimum number of females is two. If a team is short the minimum number of players by game time, the game will be considered a forfeit and an exhibition played. The minimum number of players to play an officiated exhibition game, and avoid the forfeit fine, is four. In the event of a recognized or otherwise reported event that causes a significant traffic delay to multiple teams, SSC officials will, in their sole discretion, allow an additional five minutes for players to arrive. Teams lose the ability to challenge a player’s eligibility at halftime, except in the case of a late-arriving player. Quick, repeated, or feigned substitutions intended to deceive opponents at or immediately before the snap are considered Illegal Participation. The clock will not stop for first downs or when a runner is deflagged in-bounds. If a team is ahead by 19 or more points when the 2 minute warning is announced in the second half, the game will be over. Application of this rule can only occur following a down free of any accepted penalties. Prior to any offensive down, the referee will declare the line of scrimmage and mark the ball ready for play by announcing the down, zone-line-to-gain, and gender status. Once the ball has been made ready for play, the offense shall have 25 seconds to legally snap the ball. The offense shall not snap the ball prior to it being made ready for play. On a change of possession, the referee will not make the ball ready for play until the defense has had an opportunity to get set (15-seconds maximum). Each team is entitled to two one-minute time-outs per game. If an injury occurs for which the clock is stopped, that player must leave the game for at least one scrimmage down. After a touchdown, the offense shall declare their attempted try value to the referee. Once this declaration is made, it can only be changed if no attempt has been made and that team calls a time-out. If the defense gains possession of the ball during the offense’s try after touchdown, the ball becomes dead immediately. In the case of a safety, the scoring team will next put the ball in play from its own ten yard line, unless moved by penalty. Except in the case of a penalty or turnover, teams shall begin each possession at their own ten yard line. At the snap, all offensive players must maintain a position at least five yards inbounds from the nearest sideline. If the defensive covers an offensive player positioned within five yards of the sideline, it is not a foul provided the offensive player was at least five yards inbounds from the sideline at any point after the ball has been marked ready for play. The snapper is the only offensive team player required to be on the line of scrimmage at the snap. If a snap count is used, whether verbally or nonverbally, only the player that initiates the count may receive the snap. After a huddle, all offensive team players must come to a stop and remain stationary for a full second prior to the snap or any player going in motion. The offense is allowed to have a single player in motion at the snap. The player may only move parallel to or away from the line of scrimmage. This player may not receive the snap directly from the center. No defensive players may cross the line of scrimmage until the referee’s five-second count has elapsed. Once a runner has been legally deflagged, the new line of scrimmage shall be determined by the position of the ball when the action to remove the flags occurred. If a runner’s flags fall off on their own, the runner will remain live until he or she has been touched with at least one hand between the shoulders and the knees. Fumbles become dead immediately and cannot be recovered. If fumbled backward, the line of scrimmage on the ensuing down will be the point where the ball first touched the ground. If fumbled forward, the line of scrimmage on the ensuing down will be the point where the ball was fumbled. the offensive series has not yet crossed midfield. the defense crosses the line of scrimmage, whether legally or illegally. the player did not receive the snap. the offensive series has crossed midfield, the defense has not yet crossed the line of scrimmage, and the player received the snap. it is a gender play and that player is male. Contact beyond the line of scrimmage with an eligible receiver during a legal forward pass unless two or more eligible receivers make a simultaneous and bona fide attempt to reach, catch, or bat a pass. Hindering an opponent’s vision without making an attempt to catch, intercept, or bat the ball, even though no contact is made (also known as “Face Guarding”). Note: The player must place one or both hands in front of the opponent’s face or wave their hands or arms near the opponent’s face. An eligible receiver is deflagged or tagged prior to touching a forward pass beyond the line of scrimmage. On fourth down, the offensive team must declare their intention to punt the ball or attempt to advance to the next zone line-to-gain. After this declaration, the referee will not make the ball ready for play until the defense has had a reasonable opportunity to get set. Once the defense has set, the offense may not change their declaration unless they call a time-out. With the exception of the punter, players must remain stationary until the ball has been kicked beyond the line of scrimmage. The receiving team must have at least five players on the line of scrimmage throughout the return. Remaining players may drop back to receive the punt. If the returner advances past the original line of scrimmage, players originally on the line may trail the runner to receive a backward pass. The punt may be played off of a bounce if there are no other punting team players in the area. However, the ball becomes dead immediately if it hits the ground after touching any player. Fake punts are not permitted. Punt blocks are not permitted. If a female has not acted as an operative player after two consecutive downs, the succeeding down shall be a gender play. All other plays, including extra point attempts, shall be considered open. The gender count shall reset once a female has been used as an operative player or after a change of possession has occurred. All other offensive males must remain stationary until the ball has been legally touched beyond the line of scrimmage. Once the ball has been legally touched beyond the line of scrimmage, any offensive player may trail the runner in order to receive a backward pass. If the snap is fumbled or the quarterback is sacked, the ensuing down will remain a gender play. All offensive players are permitted to participate as if the status of the play was open. If the snap is fumbled or the quarterback is sacked, the gender count shall reset and the ensuing down will be an open play. A female is determined by an official to be the intended target of a legal forward pass that crosses the line of scrimmage. A female catches a legal forward pass that crosses the line of scrimmage. A female receives the snap and attempts a legal forward pass that crosses the line of scrimmage. A female receives the snap and advances the ball across the line of scrimmage. The offense accepts the penalty for an Illegal Gender Defense foul, but declines the yardage. A female snaps the ball to a male player. A female not in position to receive the snap advances the ball across the line of scrimmage. A quarterback intentionally throws the ball to the ground near a receiver without a reasonable expectation of a reception. A forward pass is deflected by a stationary defensive male during a gender play. A male receives the snap and advances the ball across the line of scrimmage. Any male offensive player leaves the line of scrimmage prior to a legal forward pass being touched beyond the line of scrimmage. A player not receiving the snap attempts a forward pass. A male player receives the snap and intentionally throws the ball to the ground near a female receiver without a reasonable expectation of a reception. The defense must declare only one player to guard the quarterback. This player may move laterally across the line of scrimmage with the quarterback until the five-second count has elapsed, after which the player may cross the line of scrimmage only in an attempt to deflag the quarterback. All other male defensive players must individually line up against male offensive players and remain stationary with their arms down until the ball has been legally touched beyond the line of scrimmage. Except where allowed by rule, male defensive players may not touch a forward pass until it is first touched by a female offensive player. An interception by a male player is only possible if a forward pass is first contacted by a female offensive player and caught by a male defensive player who was originally restricted to the line of scrimmage during the play. All defensive players are permitted to participate as if the status of the play was open. A male defensive player makes contact with a legal forward pass unless first deflected by a female offensive player, except where allowed by rule. Any male defensive player leaves the line of scrimmage prior to a legal forward pass being touched beyond the line of scrimmage. A male defensive player does not allow a female offensive player reasonable opportunity to catch a forward pass except where allowed by rule. The defense may use all female players to guard the female offensive players . A male defensive player may cover an additional female offensive player one-on-one without a cushion. The male may make contact with a pass intended for his receiver only, but an interception will result in an incomplete pass. A male defensive player may cover a female offensive player one-on-one with a three yard cushion and must allow a reasonable opportunity to catch a pass. If a female offensive player first contacts the ball and it is subsequently recovered by a defensive male in coverage, the result will be an incomplete pass. The additional female defensive players must individually line up against a male offensive player and remain stationary with her arms down until the ball has crossed the line of scrimmage. Each game consists of two 18-minute halves separated by a three-minute halftime intermission. If at the end of regulation both teams are tied, the game will proceed into overtime. Overtime periods are untimed. The game is over when the tie is broken at the conclusion of an overtime period. Each team is entitled to a single one-minute time-out during the entire overtime. Time-outs do not carry over from the regulation period. Scoring rules do not change in overtime periods. Gender rules do not change in overtime period. Prior to the first overtime period, both team captains will play Rock, Paper, Scissors. The winning captain will have the option of choosing possession or which side of the field the overtime periods will take place. The other captain will have the remaining option. Each team will have the opportunity to score from the opposing team’s 20 yard line in four or fewer downs, unless affected by penalty. If a pass is intercepted in overtime, the ball becomes dead and the defense will begin its possession from the 20 yard line. Teams will change the order of possession after each overtime period. Starting with the third overtime period, any team that scores a touchdown must attempt a two point conversion on the try. Everyone loves a little competition, but one team dominating a league season after season can spoil the fun for everybody If a team retaining more than six players has won three championships in consecutive seasons for which they have been registered, the SSC will have the option to, in its discretion, request that team to form two or more separate teams to promote parity in the league or withdraw their registration. That team will then have the opportunity to form two separate teams with each subsequent roster approved by the SSC. Any rules not specifically mentioned here follow those set forth by NIRSA governing co-rec play.